Vice President Faisal Naseem has met with senior representatives members of Ihavandhoo School of North Thiladhummathi Atoll. 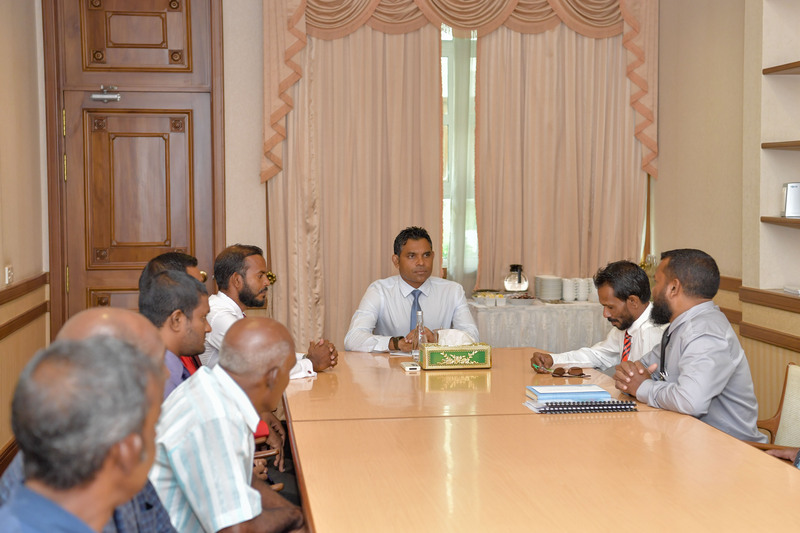 The meeting was held today at the President’s Office. At the meeting, the Ihavandhoo School representatives briefed the Vice President on the achievements attained by the school during its 50 years, and especially noted the contribution from the residents of the island. The representatives also emphasised the citizen’s hopes to see Ihavandhoo School among the top schools of the country, and informed the Vice President of the pending requirements of the school. Further, they briefed the Vice President on the activities being carried out by the students’ parents and employees of the school to mark its 50th anniversary. Speaking at the meeting, Vice President Naseem underscored the high priority accorded by the administration to develop the education sector and build an educated generation. He also noted that the highest allocation in this year’s budget was for the education sector. Further speaking, Vice President Naseem advised the Ihavandhoo School representatives to pursue their requests through the Ministry of Education. He also assured that the administration will always cooperate and support all activities that reflect the people’s dreams and aspirations.